I have a confession: during the entire month of April, essentially all healthy eating habits have taken a hiatus in my life. Family in town + going out to eat + new job and schedule are basically a recipe for disaster. That being said: my work clothes are feeling a little less roomy than I'd prefer, and it's time to nip it in the bud! Especially because, come on people, swimsuit season is upon us! Link up time! We can all write each other some motivational "airmail" to help us kick off the week right. 1. Write a post about how you're going to make this week fabulous, what your goals are, what you're looking forward to, something motivational, etc. Twist it however you want to. 2. Submit your link below and post on your blog that you are linking up with the Girlfriend Letters for Motivational Airmail. The links will be up all week. Also, add this button to your post if you want to jazz it up! 3. The links will show in random order on the list below so we can all read each other's! 4. We may even make this a weekly thing around here! 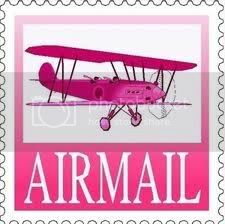 Every week we can report on Monday and send out our airmail for the next week! Plan, shop for, and make dinner at least 2 times this week (and make enough for leftovers the next day). As pathetic as that sounds, it would be (unfortunately much) better than how I have been doing. Keep better track of what I'm putting in. The cupcakes have to stop! Or at least be moderated. :) I feel like I've gone to sleep super full every night this month, and it's not a good feeling. I need to do better on fruits and veggies and rethink my sugar intake. I know I'll feel better and way more energetic if I do! Learn how to wear my clothes better so that I can use the wardrobe I have for work. I have to come up with an outfit every day now (rough, right? :)) and I want to get creative! Go to sleep by 11 every night. I'm officially an old lady- but hey- 6:30 is early and I need my sleep! Wish me luck. I have high hopes for the next seven days! I am (extremely too) giddy and excited to read all your posts!!! Ready, set, submit your links! have you tried the app, My Fitness Pal? It is so easy and helps keep track of everything you eat! Your blog is awesome! Thanks so much for stopping by and following The Girl With The Blue Bow! It'll be fun getting to know you better, as I'm now following your blog too! I'm okay with food, but I definitely need to start back in with my workouts! I think that's a fantastic resolution, homemade meals are so much better (healthier and cheaper too!). Hopefully you can find some inspiration on my blog ;) Thanks for stopping by!! ha! you are definitely not an old woman...with a little one running around we're in bed by 10:30-at the latest! This is a great promise to make to yourself. Homemade meals are definitely the best. I need to do this with you. Put out a reminder for next week! Are you enjoying the new job?!? I don't know how you stay up until 11 if you have to get up at 6:30! You're super woman!